Happy Birthday, Sierra Leone! We're 50 today. As I write, I sip a chilled glass of homemade palm wine (really coconut water with ginger beer). In the background, sweet, soft n' low is George Lewis' Burgundy Street Blues. His clarinet fills my senses and I take fictional flights of fancy out of the world Aminatta Forna based on Sierra Leone. 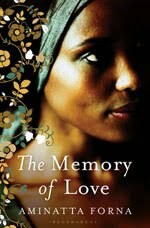 To borrow Lynda R. Young's words: In The Memory of Love, Aminatta tweaked a lot and a little. She offered enough familiar elements so the readers can imagine the worlds for themselves...offered enough detail to make the world believable, intriguing, inviting, scary, and beautiful. My first fantasy into The Memory of Love, is Mamakay playing in the Ruby Rooms with her quartet; then convalescing in bed. Like George Lewis, once upon a time, Mamakay's friends have brought their instruments-- drums, guitar-- to her bedside and they record their signature piece. Something I imagine is a cross between Afro National, Supa Combo, Ebenezer Calendar, Rogie and Rokoto. My second flight of fantasy is that today, like Tejani, I come home to Sierra Leone and to family and friends. I'm on the beach with a laughing Nenebah and a curious Abass. Our chidren are the future in the quest Aminatta Forna would like to see: [H]olding each other directly responsible for the group of which we are a part; we have begun to arrive at that point. Here's to Aminatta Forna for sharing our memories. And to the green, white and blue. Happy Birthday, Sierra Leone.